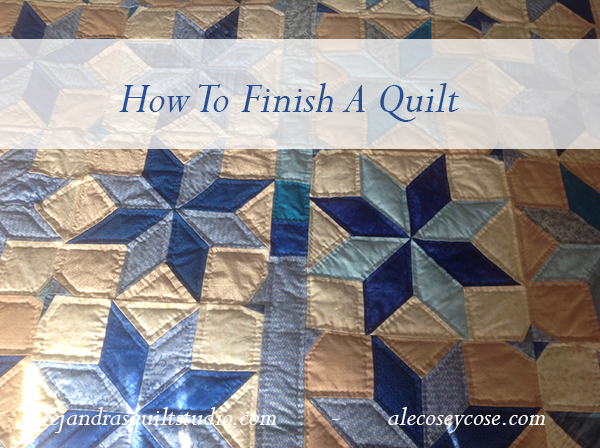 How To finish a quilt… in two months. I’m happy to share with you today, that I could finish this King Size quilt ! I guess you have been reading my quilting adventures for a while, so you might have read I wanted to make a quilt for my oldest son, as my other two sons and grandson had already one quilt each one of them. I started this quilt making the top on a sewing machine in Canada, as I was traveling to babysitting my grandson for one month, I wanted to have something to do while he is at school. This meant I only had one month to hand quilt a king size quilt, a big job to accomplish even for me, but I’m happy to share with you I finished the hand quilting this week, so I had a couple of days to work on the finishing, today is the big day, when I will give my son and his wife their quilt. 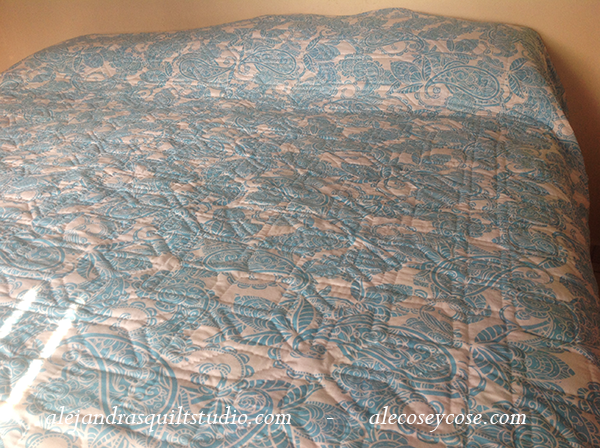 How to finish the hand quilting of a King Size quilt in just one month. 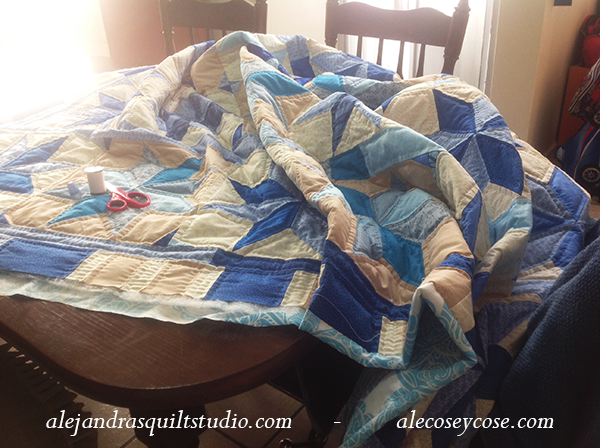 If you’re planning to hand quilting a quilt by yourself, you might want to know how I made it. First of all, don’t see this job as a job, I prefer to look at it as my hobby and passion, I really love to work doing some hand quilting. If you think on the quilt as a whole, it might look so big to do it, it’s better to think about it as something small. I set a daily goal in time, one hour, or maybe two hours per day will make a difference on your work. As this quilt is made of stars blocks, and the quilt has 36 blocks plus the borders, I figured out how many blocks I had to work on every day, so my goal was two blocks per day. First day of hand quilting was so hard! I even had some bad thoughts about this quilt! As you need to start working on the center to be sure to hand quilt correctly and don’t get any bad moment at the beginning, when you start working on the center might look so hard to do it, first block done is a great success!! Each block hand quilted is a big success!! I can even get track on a paper about how many blocks I had made, so I can see every morning my list is getting smaller everyday, and that is something to celebrate. This week I could work to finish this quilt. I think last Sunday I figured out I only had to work on two more blocks to get all blocks done!! that means happiness to every quilter in the world. By Monday, I worked on the first side to do the self bias, by Tuesday I had to work on two more borders, by Wednesday I worked on two sides of the bias, by Thursday I could work on the last border and the last side of the bias. The last stitch I did on the quilt is a big moment! Yes, I made it!!! Home alone, it’s time to see how the quilt looks like on the bed! Everybody is busy, my son and his wife are both at work and my grandson is at school. I can take a time to see how the quilt looks on the bed. I wished you could be here and share this moment with me! 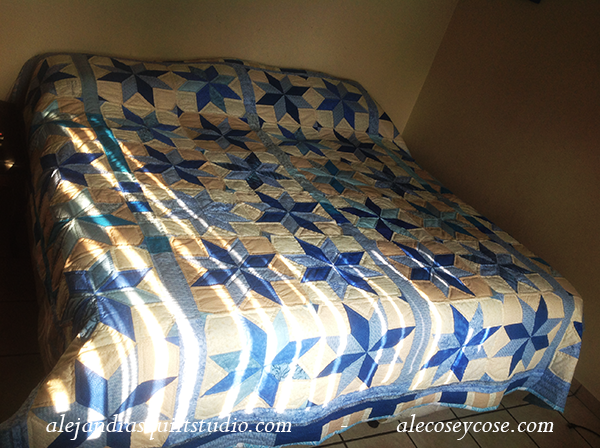 So nice to see how it looks like on the bed, all hand quilted and if may I say it… OMG I made it!! For this quilt I decided to use a light cotton wide fabric for the back with some blue and white design, it will give the quilt two views. 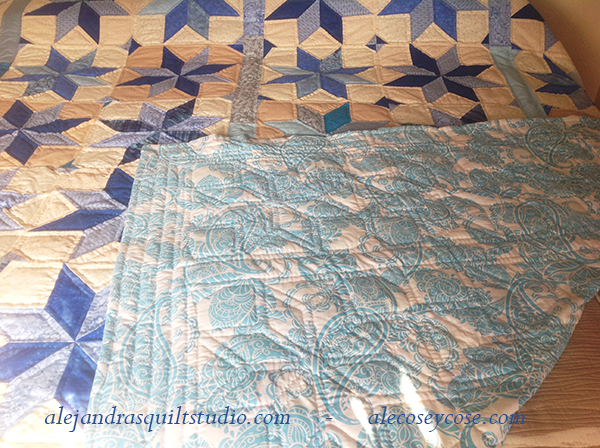 If one day you want to place the quilt on the bed upside down, you can see all the hand quilting looks nice, so you can have two views quilt. What my next quilt will be? and for who? I thank you for making the time to read this one more blog post about my new quilt, it has been like we have been quilting together! 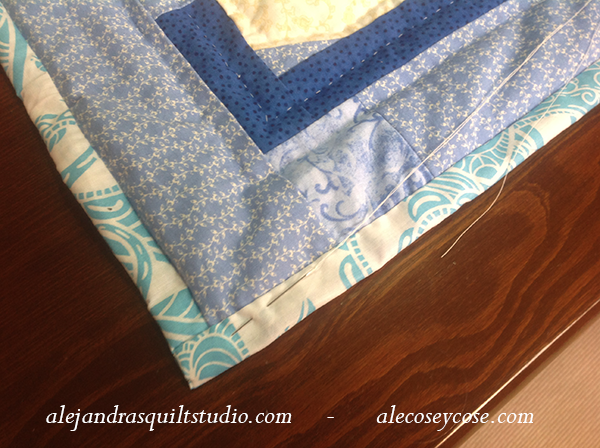 ← Hand Quilting, Half Way!